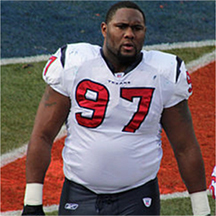 Damione Ramon Lewis (born March 1, 1978 in Sulphur Springs, Texas) is an American football defensive end who is currently a free agent. He was drafted by the St. Louis Rams in the first round of the 2001 NFL Draft. He played college football at the University of Miami. Lewis has also been a member of the Carolina Panthers, New England Patriots, and Houston Texans.